The Eli and Edythe Broad Foundation has invested millions of dollars into training managers to run school systems like businesses. They’ve put money into large scale teacher merit-pay experiments in school districts. They’ve supported legislation, including the so-called “Parent Trigger” which would allow a majority of a schools current parents to transfer a community owned public school to a for-profit charter company. The Walton Family Foundation, run by America’s wealthiest family, has invested millions of dollars in the privatization of public education. They have supported the creation and expansion of voucher programs in Indiana and other states. The attempts to improve America’s education by billionaires, none of whom have any training in education, have several things in common. First, none of the schemes have been successful enough, or been replicable on a large enough scale to improve the country’s public education system. Second, the money used to fund the projects hasn’t been sustainable. Some programs have failed when grants ended, because of the inability of the school systems to continue to pay for it. Third, nearly all attempts to improve schools measure that improvement with standardized test scores which are often inadequate. Fourth, America’s low international test scores are often cited as the reason for the billionaires’ interference in education. I have explained in detail why our students’ average scores are lower on international tests in The Myth of America’s Failing Public Schools. Finally, none of the attempts by these wealthy families, even if we assume that they are altruistic in their desire to help children succeed, attack the root cause of low achievement in America. Poverty. David C. Berliner, professor and dean of the Mary Lou Fulton Institute and Graduate School of Education at Arizona State University, presented a brief titled, Poverty and Potential: Out-of-School Factors and School Success. The report explains how improvements of schools are not enough to overcome the out-of-school factors faced by children who live in high poverty areas. …the negative effects of many [out-of-school factors] are concentrated in the schools that serve poor and minority children and families. This increases the burden on these schools in such a way as to make broad reductions in the achievement gap nearly impossible. Silicon valley billionaires are dumping their tax write-offs into America’s schools in the hopes, they say, of increasing test scores…and, if they can get a few bucks themselves in the process, so much the better. The New York Times has a long article detailing ways that projects from tech entrepreneurs, like Netflix’s Reed Hastings and Facebook’s Mark Zuckerberg, are influencing America’s schools. Once again they aren’t focusing on the real problem. The influx of money from rich technology-king benefactors has an influence on what teachers are teaching…and how they teach. After all, when a teacher or school gets a grant for a half million dollars in hardware and software they generally don’t turn it down. 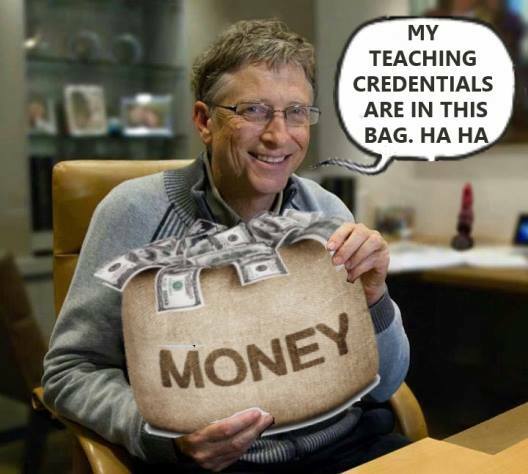 The students, then, become the “de facto beta testers” for the billionaires’ ideas. But does it actually help? Once again we have billionaires dumping money into schools, and often into privatization schemes, without regard to actual research and often without public oversight. Technology can be a powerful educational tool, when used correctly. Where did Mark Zuckerberg get his teaching credentials? Who is determining how these programs are used? Who is monitoring them to see if they work? 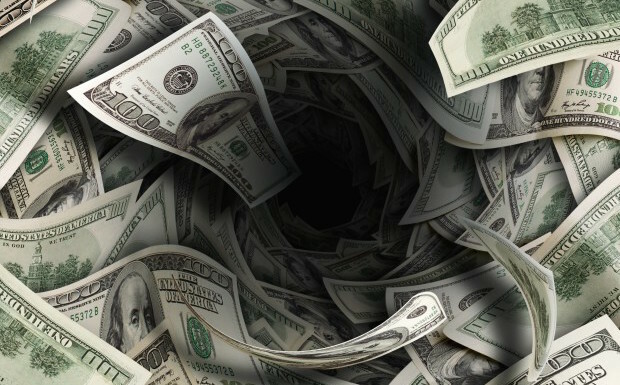 Will the money disappear if the programs fail? A New Jersey family won a lottery of nearly a half billion dollars…guess where it’s going? Last year, the Smith family in Trenton, New Jersey, won the $429 million Powerball lottery, and they planned to use all that money to help fight poverty. Pearlie Mae Smith and her seven children meant what they said at a press conference when they promised to give that money back to their community. Imagine if Gates, Broad, The Waltons, and the rest tried to improve education by donating their billions to help fight poverty, like the Smiths, in cooperation with municipalities and states. 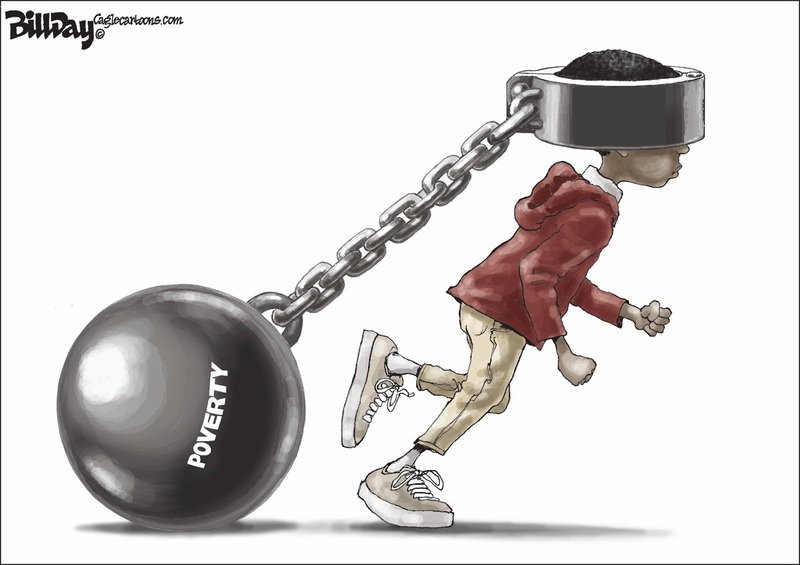 If we reduce poverty we can reduce the negative effects of out-of-school factors that get in the way of student achievement. 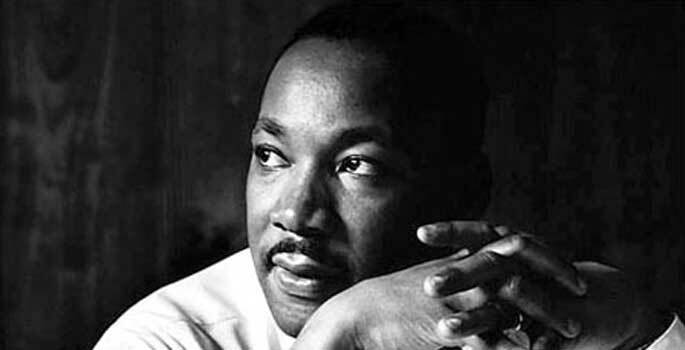 …we are likely to find that the problems of housing and education, instead of preceding the elimination of poverty, will themselves be affected if poverty is first abolished. Thirty-five percent of America’s school districts – especially high-poverty districts – use federal money to reduce class sizes. The Trump budget will result in larger class sizes in exactly the locations where smaller class sizes are needed the most. Once again, it is America’s high poverty students who are shouldering the burden so the wealthy can have a lower tax obligation. Why is this important? Class size reduction is not only extremely popular among parents and teachers – it is one of the very few reforms proven to work through rigorous evidence, and to provide especially large benefits for children from low-income families and students of color, who see twice the academic gains from small classes. Indeed, it is only one of a handful of educational policies that has been shown to significantly narrow the achievement gap between economic and racial groups. Peter Greene asks some questions about the PISA test. Privatizers and “reformers” love to quote America’s “low scores” on the PISA and other international tests (see The Myth of America’s Failing Public Schools), but new information about the PISA indicates that analyses of the results might not be accurate. What then? 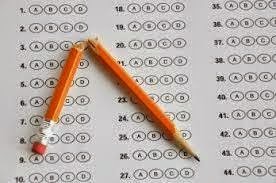 The Testocrats have been quietly assuming that taking a Big Standardized Test on a computer is exactly like taking it on paper. But what if that’s not true? What if taking a math test involves not only math skills, but test-taking skills. And what if computer test-taking skills are not the same set of skills as pencil-and-paper test-taking skills? What if the Big Standardized Tests aren’t really measuring what they purport to measure at all, and the whole test-centered education model is built on a sham? In education, just like other areas of our society, the federal government has an important role to play. In the current education atmosphere, the federal government needs to make sure that equitable funding exists for all schools. …it’s not the Department of Education that’s the problem. It’s what we’ve done to it. The department has a vital and important role to play in making sure our system of public education serves everyone. Speaking in broad terms, the department should be dedicated to these three things: ensuring public schools are being properly funded, student and parent civil rights are not being violated and to be a repository for national data and research. It’s clear that Betsy DeVos is ignorant about public education. Like other Trump cabinet and administrative appointees, she has spent her life trying to do damage to the very aspect of society her department is charged with supporting. During her confirmation hearing she proved to America that she is woefully ignorant of how public schools work. The last thing that America needs is for the nation’s schools to contribute to increased segregation by race, ethnic group, or economic status. When the Indiana General Assembly, along with then-Governor Mitch Daniels, demanded a voucher program for Indiana’s private schools, the argument was that children who live in poverty should have the same access to “high-quality” schools as wealthier students. The error in that logic is clear. A “high-quality” school is defined by higher test scores and greater support from economically affluent communities. When you segregate students economically, you’ll see schools with lower test scores in economically depressed areas. Over the last few years we’ve learned that voucher accepting private schools and privately run charter schools are not guaranteed to give children a better education. So the reason for providing tax money to private and privately run schools has changed. No longer are we diverting tax dollars away from public education in order to help poor children “escape” from so-called “failing” schools. Now it’s for “choice.” Every parent should have the right to choose the best school for their children. This is reasonable, but private choices shouldn’t be tax supported. People don’t get subsidies from the government for other “choices.” We don’t get a voucher to move into any neighborhood we want to move to. We don’t get a voucher to “choose” a private country club over public parks. We don’t get a voucher to “choose” books at a book store instead of the public library. Like other public benefits, public schools are, and should be, the tax supported option. The cost of other options are the responsibility of the tax payer. Instead of underfunding and closing public schools filled with struggling students, we should improve the quality of the school and its teachers. We need to invest in our public schools, and we need to invest more where more support is needed. The Department of Education just released a new study of the Washington, D.C., school voucher program. And the findings confirm what we’ve known for years: The program doesn’t improve students’ academic achievement. In fact, it has resulted in statistically significant negative impacts on student test scores. The study found that students using a D.C. voucher performed 7.3 percentage points worse in math than their peers. The program especially hurts students in elementary schools, which comprise 68 percent of the voucher students in the study and are the largest demographic in the program. These students performed worse in math and reading: 14.7 percentage points lower in math and 9.3 percentage points lower in reading. This conclusion isn’t a surprise considering similar results were reached in recent studies of voucher programs across the country. The studies have found negative impacts on student achievement for voucher students in Ohio, Louisiana and Indiana. PolitiFact Florida: How not-for-profit are charter schools, really? Are non-profit charter schools a better use of tax dollars? Not necessarily. The management company does not manage the governing board; rather, it handles certain aspects of the operations of the school under a contract with the governing board. The Miami Herald’s examination of South Florida’s charter school industry found several instances of for-profit management companies controlling charter schools’ day-to-day operations. The Herald found examples of charter schools relinquishing total control of their staff and finances to for-profit management companies. In Miami-Dade County, the Life Skills Center paid 97 percent of its income to cover fees incurred by a management company. What did the Indiana General Assembly give us this year? This is a state that (still) really hates its public schools. Students who receive tuition vouchers to attend private religious schools will get nearly 10 percent of the K-12 education funding increase that Indiana lawmakers included in the 2017-19 state budget. That’s an outsized share given that voucher students make up only about 3.5 percent of the students who receive funding from the state. In essence, when a Walmart employee must rely on food stamps or other safety-net benefits, taxpayers are paying a portion of that employee’s wages. Walmart (including its Sam’s Club operation) is currently the largest private employer in the country–and one of the largest recipients of corporate welfare. 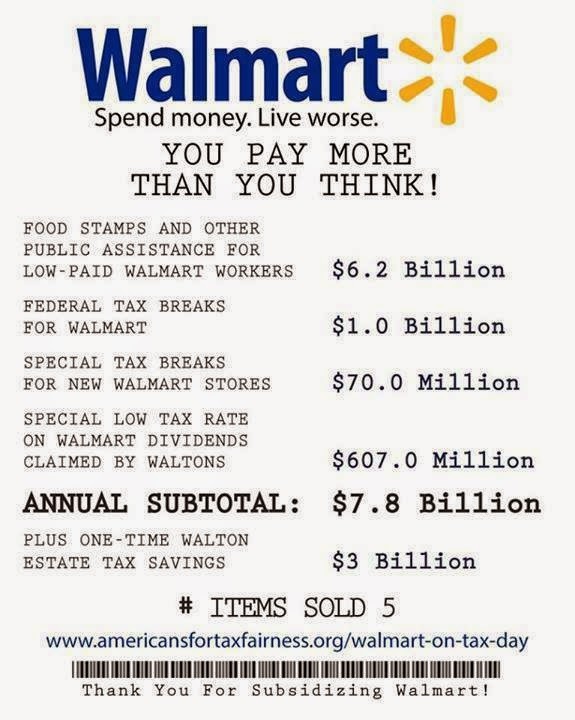 Walmart employees receive an estimated $6.2 billion dollars in taxpayer-funded subsidies each year. Money not paid out in salary goes directly to the shareholders’ bottom line. Not only is this greedy and despicable, it is bad business. For one thing, as awareness of this subsidy grows, the numbers of people shopping at Walmart declines. But there are other costs incurred. The importance of recess for young children, and children with ADHD especially, can’t be overemphasized. The Finns, with the highest academic scores in the world, make sure that young children have frequent breaks. 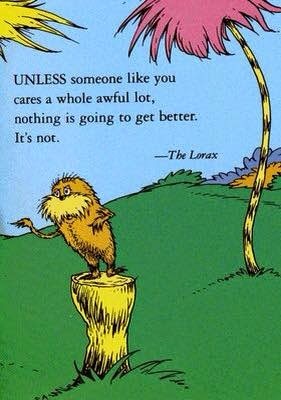 We should do the same. Lunch and recess are, for more grade­ school students, as essential as reading, writing, and math. Time spent playing kick ball or running the bases teaches our kids valuable social skills. Plus exercise releases chemicals into the brain that promote focus, sequencing, and working memory once the bell rings again. “Kids who have recess display an improved ability to stay on task,” says Dr. Larry Silver a regular ADDitude contributor. That means less fidgeting, more focusing. It also means building friendships and giving teachers and administrators a chance to see who is being bullied, isolated, or teased. 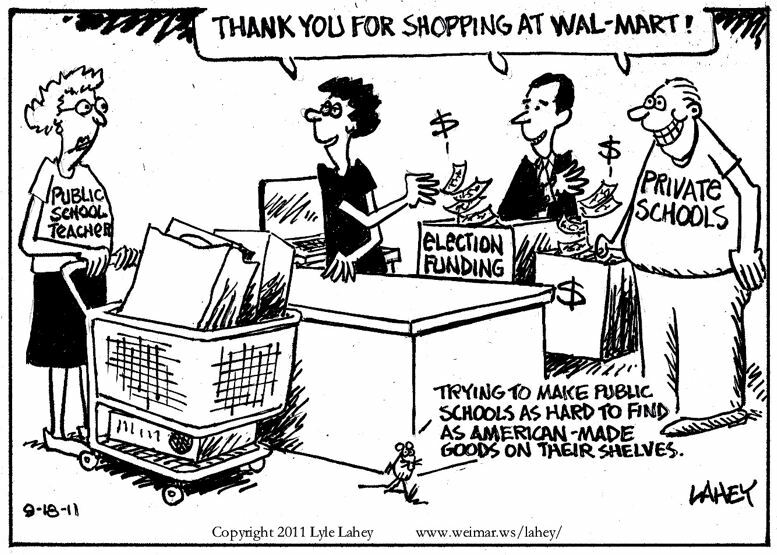 The privatization of public education will lead to the same sorts of community devastation that Walmart is famous for. Stories about local communities being devastated by business decisions made in distant headquarters have become a staple of this era. Time and time again, the nation has witnessed whole towns being hollowed out when big companies uproot local manufacturing plants to move to cheaper labor markets in Mexico or China. But what if that story isn’t just about businesses anymore? What if instead of a closed factory or shuttered store, the story is about a closed public school? What if the consequence of these types of “business decisions” isn’t a grown man having to look for another job or an elderly woman having to figure out a new way to pick up her prescriptions, but a child having his or her education significantly disrupted or a whole community left without convenient access to schools? That question is becoming increasingly urgent as more and more government officials turn to publicly funded but privately run charter schools to compete with and upend local public schools—an education option, it is worth noting, that the family behind the Walmart empire has played a huge role in promoting and funding nationwide. Co-locations are all the rage in Charter-crazed New York. 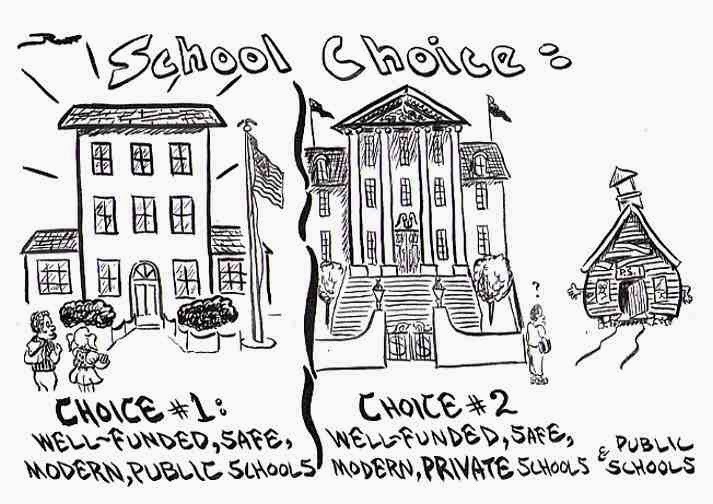 “Choice,” when there is any, belongs to the private, for profit, corporate owners, not the community or parents. Imagine this. You get a call telling you that another family will now occupy the second floor of your home. After you recover from your initial shock, you complain. “Outrageous,” you say. That is where I have my office, our second bathroom and the guest bedroom for when my mother comes to stay.” You quickly learn the decision is not yours to make. This is a top-down order, and you must comply. As far-fetched as the above might seem, the above is what principals in New York City and other cities around the country face when charter schools demand space. And although principals may not “own” their schools, the community that surrounds the school surely does. Yet, no matter how strongly they protest, community voices are nearly always ignored. Kamenetz v. Skeels: Are Charter Schools “Public” or “Private”? 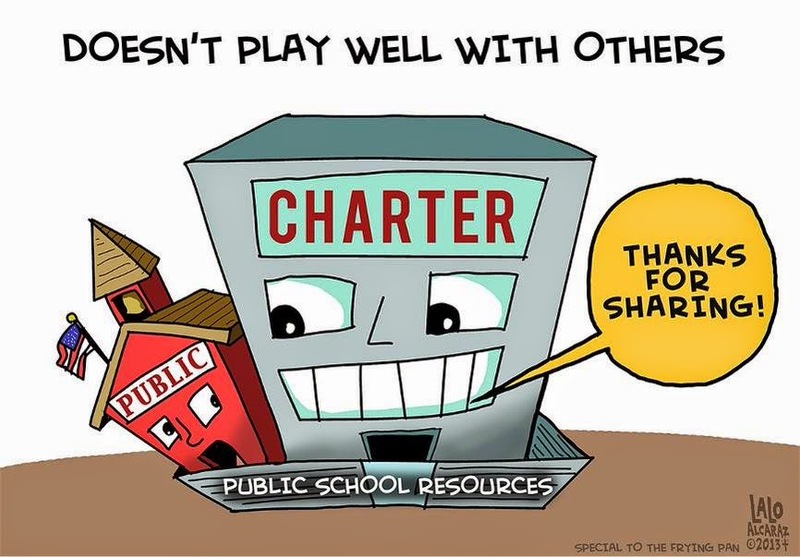 When it comes to collecting public tax dollars, charters are “public.” However, when students demand their rights, those same schools suddenly become “private businesses.” The “choice,” once again, belongs to the private, for-profit, corporate owners, not the students. VAM doesn’t work, yet states are forcing school systems to include “accountability” measures (aka student test scores) in evaluation systems…especially after the Duncan Education Department pushed it on the states without sufficient research. Bottom line: It doesn’t work. It’s inaccurate. It’s an invalid use of student achievement test data. With all the outcry and brouhaha about “bad” teachers, the VAM-based evaluations have made a mockery of actual teacher evaluations. Why are we still blaming teachers and unions for low student achievement? The appeal of the Vergara trial brings this up again…tenure doesn’t protect bad teachers. Certainly there are ways to improve the system, but denying teachers of due process doesn’t help anyone. Much of the blame for low student achievement can be laid at the feet of politicians and policy makers. …the Vergara trial did not show any damage to the plaintiffs. One of the accused teachers was Pasadena’s “teacher of the year.” Two of the student plaintiffs were enrolled in charter schools, where none of their teachers had tenure. Some of the other teachers did not have tenure. The apparent determination of one particular Party to restrict citizens’ voting rights irks me. What kind of a future do we build for the country if we raise all these kids as disadvantaged, as unable to cope with the society, as resentful for the injustice served up to them. This is stupid. We are one of only three wealthy nations in the world who spend more money to educate the children of the wealthy than we do to educate the children of the poor. How bad are conditions in Detroit public schools? This appalling. The odorous smell of mold and mildew hits you like a brick wall when you step through the front doors at Spain Elementary-Middle School in Detroit. I have been at Spain for 19 years, first as a first-grade teacher, then, after earning a master’s degree in counseling, as a school counselor. When I first started, it was a school any city would be proud to have in its district. Today, it’s the poster child for neglect and indifference to a quality teaching and learning environment for our 500 students. The gym is closed because half of the floor is buckled and the other half suffered so much rainwater damage from the dripping ceiling that it became covered with toxic black mold. Instead of professionally addressing the problem, a black tarp simply was placed over the entire area like a Band-Aid. That area of the school has been condemned. The once beautiful pool sits empty because no one has come to \fix it. The playground is off-limits because a geyser of searing hot steam explodes out of the ground. What do our kids do for exercise with no gym, playground or pool? They walk or run in the halls. Seriously. Our pre-K through eighth graders move like mall walkers. Exposed wires hang from missing ceiling tiles. Watermarks from leaks abound. Kids either sit in freezing classrooms with their coats on or strip off layers because of stifling heat. How can you teach or learn in conditions like these? Since 1999, the state has been “taking over” Detroit Public Schools. Since 2009, Detroit’s schools have been subject to a stream of emergency managers who move in for just under 18 months, do not answer to voters, and can basically do what they want without consequence. Flint, Michigan has become ground zero for the battle against America’s poor. Democracy was canceled, a state sponsored dictator was imposed upon the people, and, through neglect and shortsightedness the families of Flint were poisoned. The dictator, after doing his damage, has now moved to Detroit, to manage the public schools. This isn’t specifically about Flint…just about what happens when an entire city has been poisoned. Infants and children exposed to lead may suffer in various ways, including delayed puberty, speech impairment, high blood pressure, hearing loss, decreased muscle and bone growth, kidney damage, and a weakened immune system. Breastfed infants are also at risk if there is lead in their mother’s bloodstreams. 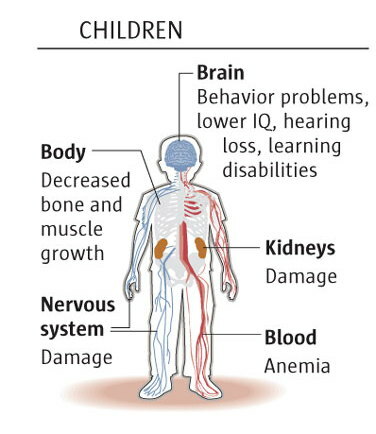 Equally important, lead also affects children’s brains and nervous systems. Those exposed to lead at a young age may suffer from a coma, convulsions, or even death. Children who survive serious lead poisoning may be left with mental retardation and changes in behavior, like a shortened attention span or increased antisocial behavior. Diversity in our teaching force is essential. People often say the solution to our education problems isn’t more money. But in this case, it might be. Thanks to Parents Across America for this well thought out and comprehensive information sheet about the evaluation of teachers using student test scores. VAM is built on junk-science and tries to put a number on something that can’t be measured by numbers – the impact that a caring adult has on a child. It also doesn’t even attempt to include other valuable aspects of teaching such as the ability to motivate and inspire students. The proliferation of high-stakes standardized tests has had many negative side effects. Overtesting has led to increased stress, a narrowed curriculum and widespread teaching to the test. It has caused students to lose interest in school and learning, driven excellent teachers from the profession and discouraged young people from pursuing teaching careers. It has fueled the school-to-prison pipeline, sparked cheating scandals, and diverted time, energy and resources from other educational goals. These negative effects have been especially evident in schools that serve low-income children of color. Even if VAM ratings could be calculated accurately, the limited information they provide is simply not worth the effort or the consequences. 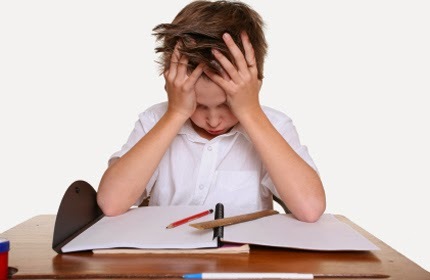 Here’s a story from the mom of an ADHD and Learning Disabled child…and the damaging effect of testing. Specifically, the piece is about DIBELS, and how difficult it is for her child to focus and succeed. The child says “I’m stupid,” a common response from students with learning challenges when they are faced with impossible tasks and tests. At the end of the article the mom says, “DIBELS has affected my home life and my daughter’s self-confidence. I know that there are many benefits to conducting this test in schools.” That’s wrong. DIBELS is not a good test. Its benefit is that it’s short and it provides numbers. Whether those numbers mean anything is questionable and it’s still in wide usage. DIBELS sounds like a disease, doesn’t it? It stands for Dynamic Indicators of Basic Early Literacy Skills. It is one of North Carolina’s ways of testing our kids to make sure they meet the requirements for No Child Left Behind (NCLB). DIBELS is a computerized test, administered by a teacher to acquire a child’s knowledge in oral reading fluency, retell fluency, and word use fluency. Teachers hold a handheld device that records a student’s response to the content being assessed. Why would this test cause my daughter to feel like she is not smart, can’t read, doesn’t know how to write, and to hate school? It is a timed test that some adults would find stressful. DIBELS allots one minute to each section of the test. One minute? Give me a break. I can’t even pack a lunch in one minute, much less think about being tested on my knowledge. My Medley wouldn’t be complete without something from Curmudgucation’s Peter Greene. The last paragraph below shows Greene’s insight into the “reform” movement. Treating school like a business, like Wal-Mart, for example, provides billions for those at the top, but “cheap mediocrity” for the rest of us. If they were truly concerned about the well being of students, and improving schools, the Waltons would notice this cognitive dissonance. The fact that they don’t implies either the conscious misuse of their economic power for more economic gain, or a lack of ability to comprehend what they are actually doing. The thought was that more choices would generate more competition. Competition would catalyze systematic improvement. I continue to be gobsmacked that the Waltons, of all people, would imagine that school choice would spark competition that would lead to excellence, because these are people who seem to have a pretty good idea of how the free market works– and the free market does not work in ways that go well with public education. Here is a thoughtful piece by John Kuhn about how America’s public school teachers have no time to think. Teachers have no voice in policy, as has been noted often. Non-practitioners may implement wrong-headed approaches, the same ones others implemented in bygone eras–and they may go all-in on them, and stick with them long after it becomes clear that they don’t really help–but yet, there’s this thing: the teachers, even if they wanted to improve their profession, are too busy to engage fully in the same way the leading minds of other professions engage. We can’t engage in policy-shaping; we can’t even sharpen our saws. Not content with destroying K-12 public education Duncan sets his sights on higher education using the fake science of VAM and invalid use of K-12 student test scores. Arne Duncan wants to set the standards for teachers’ colleges and use the power of the federal purse to evaluate them. It seems there is nothing that Arne Duncan is not competent to judge, other than the success or failure of his own initiatives. He has used Race to the Top funding to push test-based teacher evaluations (VAM), which have worked nowhere. He has used RTTT to impose Common Core standards, which are designed to align with tests that will fail most students. He has used RTTT to encourage states to privatize more public schools. Many districts now, spurred on by Duncan’ s rhetoric, are thinking of adopting the New Orleans model of an all-charter district, even though the Recovery School District rates 65th of 68 districts in Louisiana and most of the charter schools are graded as D or F schools by the state. Yes. It’s on purpose. The three articles which follow…the first by Peter Greene (Curmudgucation), the second by Jennifer Berkshire (Edushyster), and the last, from Rethinking Schools, give both the history and rationale behind the global education reform movement (GERM). If you are new to the fight and want to know some of what’s happened and why, these are must-read articles. By creating a system in which teachers are no longer the experts on what they teach or how to teach it, reformsters turn teachers from educated professionals into content delivery workers. You don’t need a building full of education experts– just one or two to direct the rest of a staff of drones. Use a boxed program like engageNY– anybody who can read the script and the instructions can teach students. Teachers frequently scratch their head and ask, “Are they TRYING to drive people out of the profession? ” Well, probably, yes. Teach for America “teachers” are not a stop-gap measure– they’re the ideal. They don’t stay long enough to get raises, and they don’t saddle the district with any expensive pension costs. And they’re young and healthy, so even insurance costs are low. Teachers who spend a lifetime in the profession are an expensive nuisance; what we need are a regular supply of compliant short-timers. …when you look at the agenda of the biggest and richest corporate lobbies in the country, it’s impossible to conclude that they want to see the full flowering of the potential of each little kid in poor cities. To say *I want to cut the minimum wage, I want to prevent cities from passing laws raising wages or requiring sick time, I want to cut food stamps, I want to cut the earned income tax credit, I want to cut home heating assistance. Oh but, by the way, I’m really concerned about the quality of education that poor kids are getting*—it’s just not credible. You’re creating the problem that you now claim to want to solve. a) Education is a multibillion dollar market, and the private sector is eager to get its hands on those dollars. b) Conservatives are devoted to the free market and believe that private is inherently superior to public. c) Shrinking public education furthers the Republican Party goal of drastically reducing the public sector. d) Privatization undermines teacher unions, a key base of support for the Democratic Party. e) Privatization rhetoric can be used to woo African American and Latino voters to the Republican Party. Charters claim to be public schools, but in truth are private schools which are run with public money. They should be required to take all students…and provide for their education. Instead, when they run up against students who are more expensive or more difficult to teach, they too often “counsel them out”…or in this case, just kick them out. …the disproportionate suspension rates are a symptom of a much deeper problem. Charter schools, he says, are using harsh, zero-tolerance discipline to weed out problem students and boost standardized test scores. “I think there’s strong evidence from [studies] and anecdotally” that support that theory, said Bryant, director of Education Opportunity Network, a public-school policy center. “Charter schools discriminate and select their students in many different ways,” he added, including out-of-school suspensions and expulsions, to winnow out underachievers. That’s because of the bargain that charter schools have made with the taxpayers that fund them. In exchange for taxpayer money and the freedom to innovate, charter schools are held to a higher academic standard, particularly on student achievement and assessment tests. But because they’re still public schools, Bryant said, they have to accept any kid who wants to attend. How many teachers didn’t vote in the last election? The American Statistical Association has already “advised caution” on the use of VAM for teacher evaluations…now a group of professionals does the same. When will “reformers” decide to listen to professionals? The National Association of Secondary School Principals has entered the loud fray over teacher evaluation, giving preliminary approval to a statement that says test-score-based algorithms for measuring teacher quality aren’t appropriate. Disgraced former Indiana and Florida Superintendent Tony Bennett had to pay a measly $5000 fine for his dishonesty in dealings with charter schools in Indiana. Now, it turns out that he was using state employees for campaigning…on state time. Those of us who voted for Glenda Ritz also paid, through our taxes, for Bennett to campaign against her. What a hypocrite. INDIANAPOLIS – A monthslong investigation into former Indiana schools Superintendent Tony Bennett’s use of state staff and resources during his 2012 re-election campaign found ample evidence to support federal wire fraud charges, according to a copy of the 95-page report viewed by The Associated Press. Despite the recommendation that charges be pursued, Bennett has never faced prosecution for such charges – which could have carried up to 20 years in prison. The investigation, which was completed by the inspector general’s office in February, found more than 100 instances in which Bennett or his employees violated federal wire fraud law. A Walton’s Plan to “Fix Public Education.” Uh huh. I cringe when I hear a teacher talk about shopping at Wal-Mart. Aside from the fact that they get taxpayers to foot the bill for billions of dollars in welfare costs, they pay more billions to support charter schools and voucher programs. These people are the epitome of anti-public school privatizers. As a historian of school reform, I have written more than I want to remember about those rose-colored, feverish, high-tech dreams that appear time and again promising to transform classroom practice and how students learn. This video is seven minutes long and it vividly captures the hollowness of each generation’s claim that “This Will Revolutionize Education.” But far more important the video zeroes in on the centrality of the teacher to student learning beyond conveying information which new technologies are superb in doing. 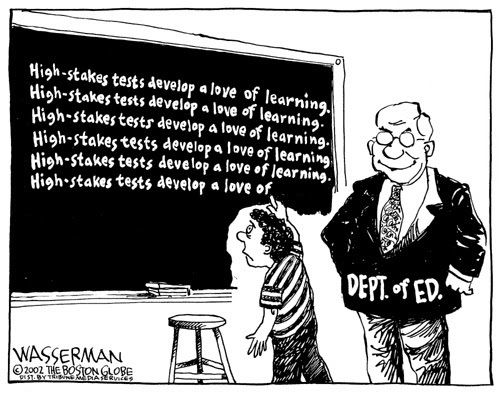 Here’s what to do when you want to fight against high stakes tests! 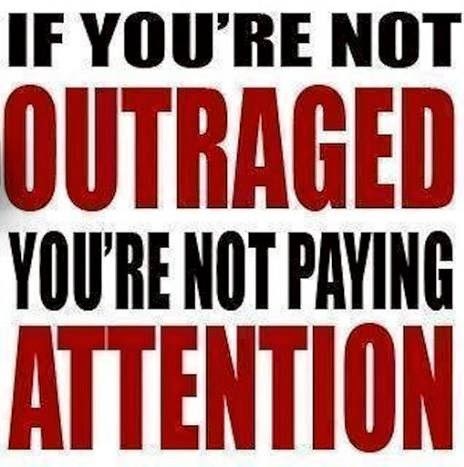 Send the following to your legislators…often! 5 Things you can do to stop the use of these tests on your child. 1. Share this message with your friends and form a group to fight for change. 2. Send this message to your state legislator demanding an end to this testing. 3. Send this message to your local school board with a letter asking them for support in ending high-stakes testing. 4. Use this information to write a letter to the editor demanding change. 5. Most importantly, refuse* to allow your child to be tested on these high-stakes standardized tests. In the Read Aloud Handbook, Jim Trelease wrote about the 1983 Commission on Reading and the subsequent report Becoming a Nation of Readers. “The single most important activity for building the knowledge required for eventual success in reading is reading aloud to children.” “It is a practice that should continue throughout the grades.” The commission found conclusive evidence to support reading aloud not only in the home but also in the classroom. In their wording—“ the single most important activity”—the experts were saying reading aloud was more important than work sheets, homework, book reports, and flash cards. One of the cheapest, simplest, and oldest tools of teaching was being promoted as a better tool than anything else in the home or classroom— and it’s so simple you don’t even need a high school diploma in order to do it. Reading is still the most important daily activity for most American adults — reading an email from their supervisor, reading a manual for installing an appliance, or reading the want ads looking for a job. During leisure time people read tweets, Facebook posts, blog entries, emails from friends and relatives, newspapers and magazines, and even books…including ebooks or tree books (traditional paper and ink books). Has the focus on reading (through standardized tests) improved the reading of Americans? Most Americans are functionally literate…and can read enough to get through their days…some with great facility. But deeper reading requires an incentive. That incentive is reading aloud. On the whole, children whose parents read to them learn to read earlier, better and faster than children whose parents don’t read to them. 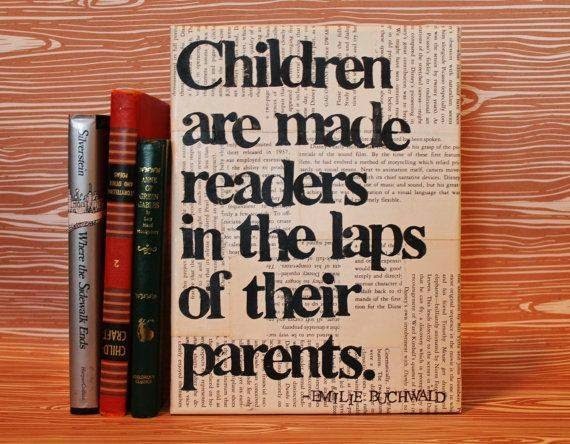 Parents who read a lot have children who read a lot. It’s that simple. As adults we read for a purpose…either for work, for interest or for pleasure. 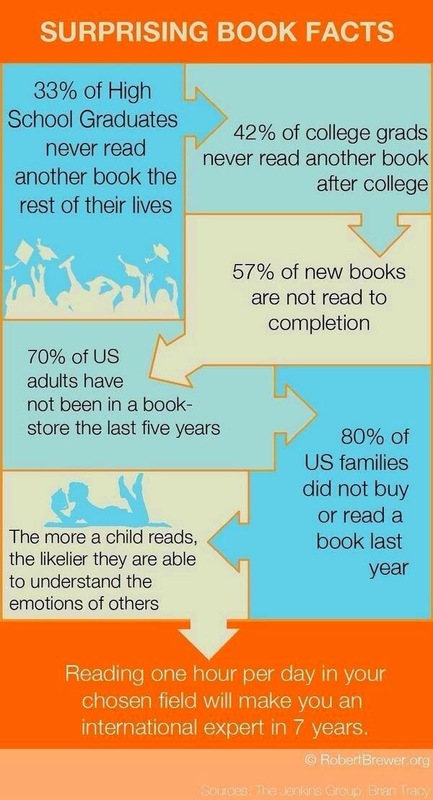 Children need a purpose for reading as well. Is testing the only reason we teach reading? Sometimes it seems that way. While politicians, school boards, principals, and teachers are focused on data and testing, students are focused on what they have always been focused on — learning about the world and developing relationships with the people around them. 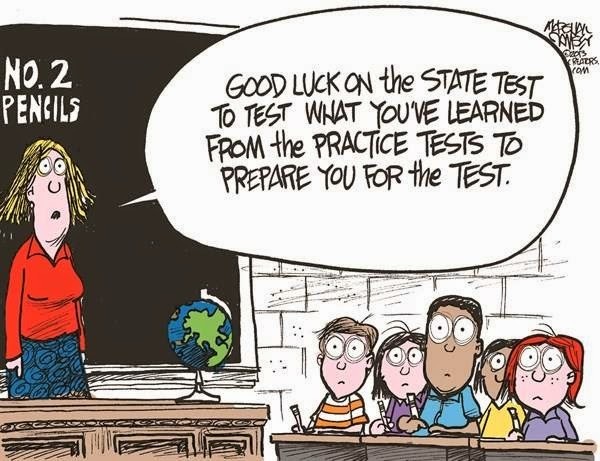 We can claim that our insane obsession with testing is an appropriate way to measure learning and hold schools, teachers, and students accountable, but that doesn’t make it true. We understand that a healthy diet is necessary for our children’s growth and long life, but we don’t seem to understand that children’s minds need a healthy diet, too. Corporate charters drain funds from public schools and have about the same success rate. The difference is that public money is going into the pockets of corporate shareholders and CEOs. Meanwhile public schools are left with fewer resources, more expensive to educate students, and in some cases, less space in their building. How much does it cost you at Walmart? We subsidize the richest family in America — the Waltons — through our taxes. Our money goes to their workers, who make such low salaries they qualify for public assistance, and to the wealthy owners through tax breaks. Still think you’re saving money at Walmart? Last month the University of Walmart Arkansas released a report — from their Department of Education Reform — that showed charter schools are underfunded. Max Brantley at the Arkansas Blog, no friend of the Waltons, reported the following. The Walton-subsidized University of Arkansas has issued a news release today about a report from a Walton-financed arm of the UA, the Department of Education Reform, that more money is spent on conventional public school districts than on charter schools, which the Walton heirs are spending hundreds of millions to promote in the United States, often to the detriment of existing public school districts. He also suggested a few reasons that charter schools are not getting as much as real public schools. I believe there are some understandable factors that lessen the the drama about the gap, ranging from less-experienced teachers who are paid less, differences in facilities and extra money given to public school districts for such considerations as desegregation plans (money to be phased out in Little Rock, for example) and federal money for poor students. The biggest gap is a lack of local property tax revenue for charters and state construction funding. Walton lobbyists have managed to open the door in Arkansas a crack on construction funding with a state-subsidized revolving loan fund. Perhaps the Walton sponsored report is correct…that charters do get less taxpayer money than real public schools, but charters also have corporate and state sponsors which subsidize their operations…for example. Since 2002, the [DC Prep] charter network has received close to $1.2 million from Walton in direct grants. 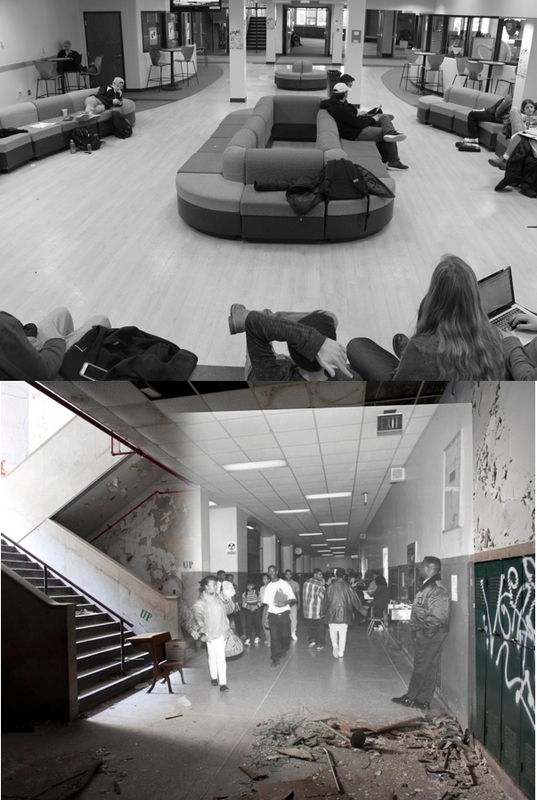 A Walton-funded nonprofit helped DC Prep find building space when it moved its first two schools from a chapel basement into former warehouses that now have large classrooms and wide, art-filled hallways. One-third of DC Prep’s teachers are alumni of Teach for America, whose largest private donor is Walton. A Walton-funded advocacy group fights for more public funding and autonomy for charter schools in the city. Even the local board that regulates charter schools receives funding from the Walton Family Foundation. So aside from the fact that this charter company uses novice, untrained, and cheaper, teachers (and most charters don’t have those pesky unions to negotiate a living wage and reasonable working hours), the Waltons have dumped $1.2 million on them. In Indiana, the 2013 state legislature added to the profitability of charters by forgiving more than $90 million in start up loans. 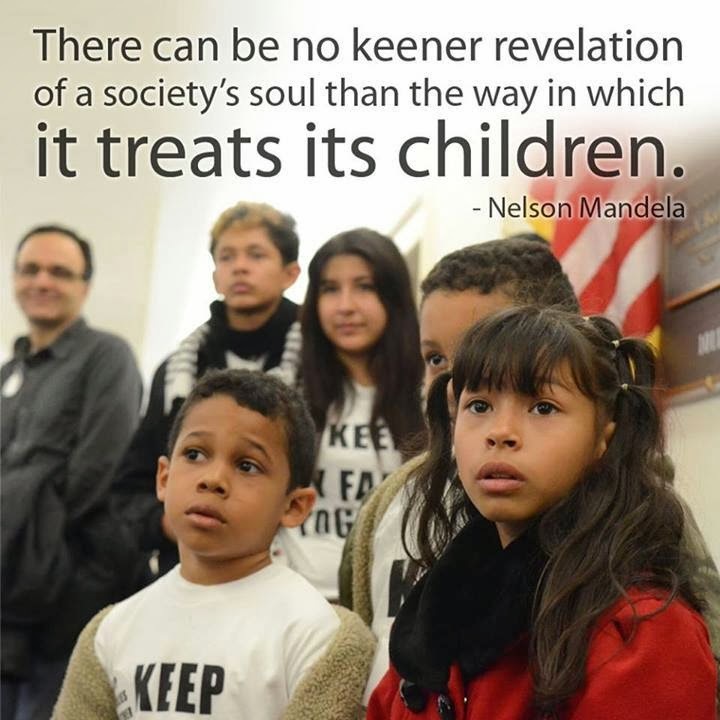 KIPP schools get corporate subsidies and foundation grants…see HERE and HERE. 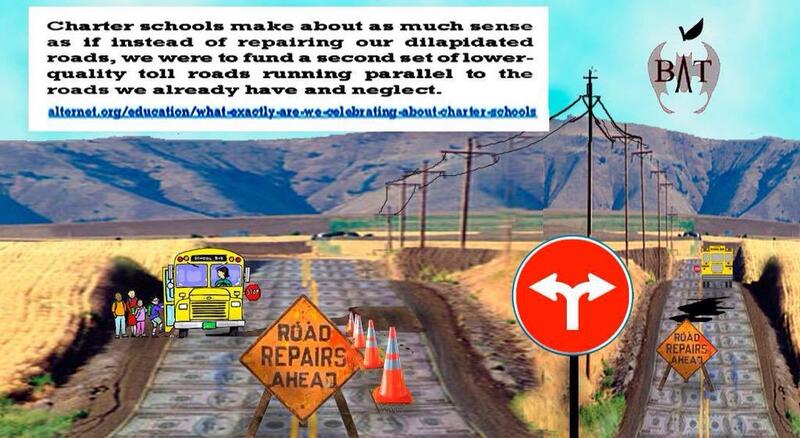 Yet all that extra money given to charters don’t make them better than real public schools. Charters don’t do better than traditional public schools…meanwhile the charter industry is increasing racial and economic segregation in the nation’s schools. Charter schools use public funds…but are apparently running short. Perhaps it’s in the way they are handling their budget. 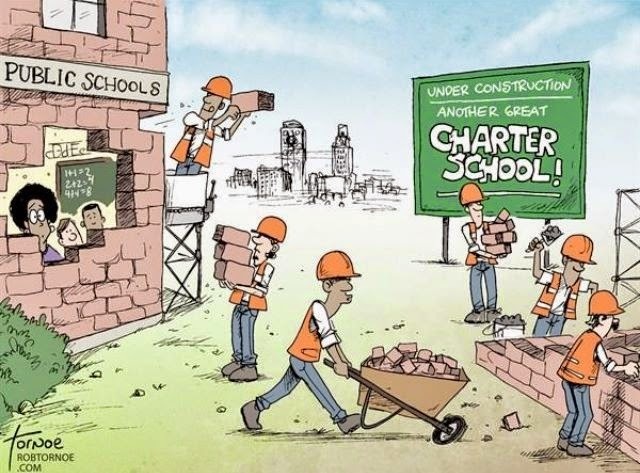 Unfortunately, many charters spend public money without any public oversight…and today, Bill Moyers reported on fraud, mismanagement and waste. During National Charter Schools Week, we pay tribute to the role our Nation’s public charter schools play in advancing opportunity, and we salute the parents, educators, community leaders, policymakers, and philanthropists who gave rise to the charter school sector. Let’s also pay tribute to the role charter schools play in increasing segregation, draining public funds away from real public schools, and filling the pockets of corporate cheaters.